The commissioning of missionaries is always a highlight at Grace Brethren conferences. Celebrate 2010, the annual conference of the Fellowship of Grace Brethren Churches, is now history. Held last weekend (July 16 to 20) in Cincinnati, Ohio, the conference was nontraditional in format but still very much a traditional annual meeting in spirit. The conference kicked off on Friday, July 16, with the chaplain’s luncheon, a time when the military (and other) chaplains in the Fellowship of Grace Brethren Churches are recognized. (This year, eight chaplains shared about their various ministries.) The rest of the day was set aside for the meetings of Women of Grace and the Association of Grace Brethren Ministers. Friday night included a Concert of Prayer, facilitated by Mac Pier, president of The New York City Leadership Center (NYCLC), a new independent non-profit organization, which was recently planted by Concerts of Prayer Greater New York. The conference delegates spent time praying for themselves, each other, the lost, and the world. Saturday, registrants from Celebrate joined with the students at the Momentum youth conference to minister as part of We Care, Dayton. They scrubbed toilets in a senior citizens tower, played games with kids at community picnics, painted aging houses, and talked with people about the love of Jesus, to name a few. It was an effort to put hands and feet to the gospel, going into neighborhoods and meeting needs while sharing about Jesus Christ. Representatives of incoming congregations to the Fellowship of Grace Brethren Churches were introduced Monday morning. 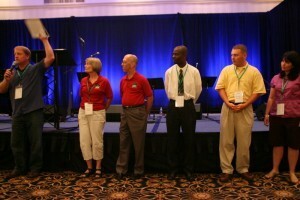 At business meetings on Sunday and Monday, the conference welcomed four congregations into the fellowship. They include Darby Grace Brethren Church (Shawn Kaeser, pastor), Plain City, Ohio; MISPA Missionary Community (Luc Nonorme, pastor), Miami, Fla.; Capital City Grace Brethren Church (Larry Totzke, pastor), Columbus, Ohio; and Iglesia Vida Nueva, (Abner A. Solano, pastor), Grandview, Wash. Also approved as a cooperating ministry was Servant Send Ministries, an organization founded by Grace Brethren pastor Dan O’Deens that will have a two-pronged focus: nextchurchplant.com, an individualized approach to mobilizing and motivating church planters and churches to accomplish their vision, and CPR-3 (Crisis Preparation Readiness), to help the Church provide hope in the time of crisis. In addition, the conference voted to remove the provisional status from Go2 Church Planting Ministries and Vision Ohio. At the 2008 conference, Go2 was granted a provisional national ministry status and Vision Ohio was granted a provisional cooperating ministry status. To see photos from the conference, see FGBC World on Facebook.